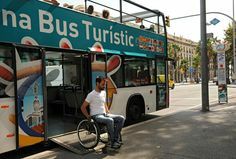 Barcelona has various tour bus companies and they are an excellent way to enjoy the city and all its major attractions if you only have limited time. The one I have experience of is the City Sightseeing Tour. The tour offers three different routes, blue (with 12 stops),red (with 23 stops) and green (Summer months only, with 9 stops) and you can get on and off the buses as many times as you like. The buses are all wheelchair accessible but be aware that wheelchair users have to stay downstairs. People with walking difficulties may be able to access the upper deck via a steep staircase where the views are better but it can be very hot and sunny during the summer months so be sure to take a hat, sunglasses and cover up or wear plenty of sunscreen. My personal advice if you are able to negotiate the stairs is to do the entire red route without getting off, here you will see the majority of Barcelona’s main attractions and get an excellent overview of the city. After that you can stay downstairs and get on and off at the stops that interest you with ease. Another tip is to avoid buying your tickets at Placa Catalunya as there are always long queues but to buy your tickets on the bus at one of the smaller stops (closest to your hotel, for example).